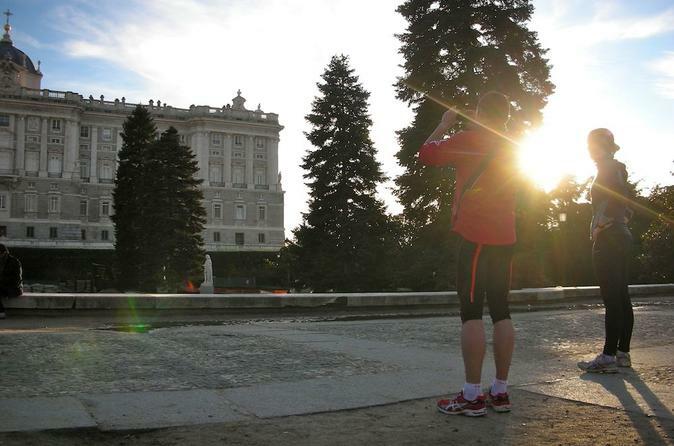 Discover Madrid on your sneakers during this Private Running Tour. You can choose from different lengths, varying between 8km and 21km. During these 2-3-hours private running tours, led by a guide passionate about sports and the city, you will get a complete overview of what the city has to offer while getting your exercise done. The itinerary and starting times are flexible. Also: an additional pick-up service is available if you prefer to start at a different location than your hotel lobby. Opt for a leisurely jog at a conversational pace with stops factored in, or ramp up the speed with a fast-paced run to cover more ground. Sightsee around town, passing attractions such as the Royal Palace of Madrid (Palacio Real), or explore parks like Casa de Campo or Buen Retiro Park. It’s an experience to suit all: avid runners, casual joggers or business travelers wanting to escape the hotel treadmill. Meet your private guide and start with a quick chat about the type of run you want to do as well as your level of fitness. Your route is also up to you; if you know Madrid well, let your guide show you some off-the-beaten-path sites. Alternatively, explore the city’s parks and green spaces or run through the downtown streets to see some of Madrid’s top attractions.